Heritage Glaze is a thin acrylic, clear suspension medium. It brushes on smoothly and is excellent for soft sealing and barrier coat use. When dry, it creates a light satin finish. It dries quickly to allow multi-layering techniques. For more information as well as detailed directions for use and techniques please visit Global Art Supply. 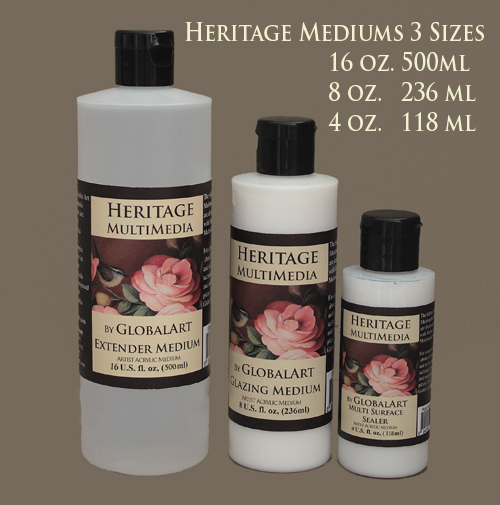 Heritage Extender/Blending Medium is a propylene glycol solution. Use this medium to slow the drying time and to increase brush ability and open time of the paints and mediums. It can be used at any stage of the painting process and can be added up to the rate of 20% to the paints and mediums. Use it in brushes as a conditioner or to prevent paint from drying in the brushes before washing. For more information as well as detailed instructions for use and techniques please visit Global Art Supply. Heritage Multi-Surface Sealer is a resin based medium that will create and exceptional barrier between the surface you chose to decorate and the subsequent layers of paints and mediums. Heritage Multi-Surface Sealer is about 20% solids which means it will increase both hardness and durability of the paint when it is mixed directly into it. When added to Heritage paints, Multi-Surface Sealer will increase the adhesive qualities of the paint and can be added to any of the paint colors for outdoor applications. It is compatible with any of the Heritage mediums. Sealer will dry in 10-20 minutes depending on humidity. You have the option of using a hair dryer to speed drying time. Sealer will fully cure in 2 weeks, however it is 80% cured within 24 hours so you may safely work on any surface it is applied to after 24 hours. Clean up with soap and water. Heritage Varnishes are a state-of-the-art clear, non-yellowing, resin-based acrylic varnish. They brush on smoothly, self-leveling so that the artist doesn't have to stroke and stroke to smooth it out. It will give the quality protection of a Polyurethane varnish with the ease of application you have enjoyed from acrylics. Heritage Varnish is excellent for both interior and exterior use. When dry, it creates a hard, durable satin finish that is ideal for artwork on a variety of surfaces. Heritage Varnish is compatible with all Heritage paints and mediums. It is a non-toxic and cleans up with soap and water. Heritage Texture Medium is a thick semi-translucent material that can be used to achieve a variety of textural effects. It dries to a hard finish in 2 to 4 hours, depending on room conditions. When dry the Medium is flexible and has a matte finish. Texture medium contains at least 50% solids so when you add it to the paint the paint will have a tremendous amount of texture. It can be applied by brush, or with a palette knife. Texture Medium is compatible with all paint and mediums in the Heritage line so you can add it anytime you want any medium or paint to have more body or texture. Heritage Faux Finishing Medium is a thick, semi-transparent medium which, when added to Heritage colors can create a vast array of faux finishes and texturing possiblities. Faux Medium gives the paint extra body so it stays put when applied. Faux Medium also adds transparency to paint colors which makes it ideal for wood graining techniques. Its chemical properties give it an extended open time which allows the artist to create patterns and textures for up to 20 minutes before it begins to dry. Heritage Faux Finishing Medium is compatible with all Heritage paints and mediums. It is non-toxic and cleans up with soap and water. Because it is an acrylic product, it should not be used over oil based products. Heritage Multimedia Light Primer is a medium that contains everything needed to prep a surface for decoration while containing a little pigment to allow you to make various background colors. It is a great all purpose sealer for general woods, and sands beautifully to give you the perfect "tooth" to paint on.